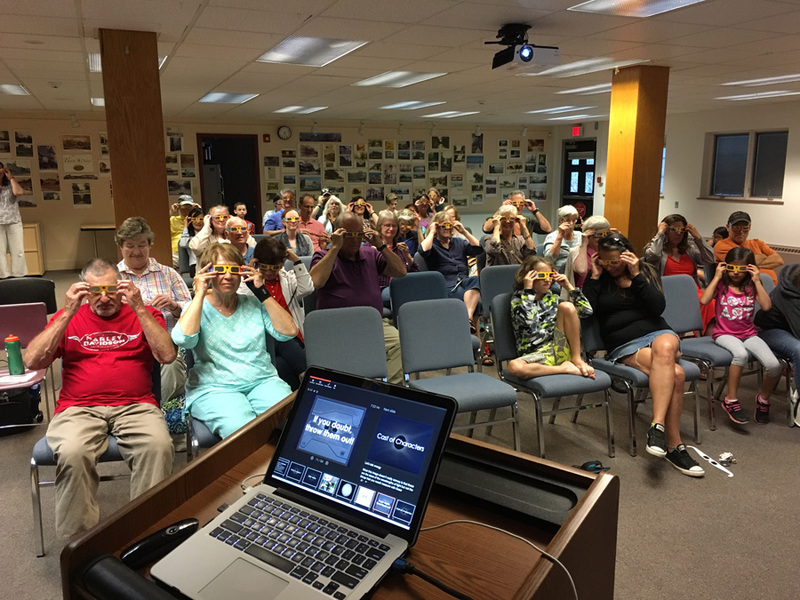 Observers testing solar glasses at Cazenovia Library on August 16. This week’s “Stargazing In Upstate New York” article is up at syracuse.com and newyorkupstate.com (and posted a little too late here). Nothing left to do now except wait impatiently for approximately 1:15 p.m. Monday afternoon. Below is a final list of scheduled lecture and observing opportunities around Upstate New York for the 21st. As always around here, we can only hope for clear skies! We continue the push for the solar eclipse on the 21st, including a list of scheduled events around the CNY area (and a bit beyond). Below is a list of scheduled lecture and observing opportunities around Upstate New York for the eclipse – this list will be reproduced in the following articles and will hopefully be added to as other locations announce events. If you know of an event not listed, please send an email with details. As always around here, we can only hope for clear skies! We continue the push for the solar eclipse on the 21st, including a list of scheduled events around the CNY area (and a bit beyond). The Persieds peak as of the next posting, although the moon will wash out much of the splendor of this meteor shower.